One task carried out by administrative staff on the hemodialysis ward is the scheduling of patients dialysis sessions on the available equipment. cyberREN maintains a schedule for the use of hemodialysis chairs/beds (called station or location in cyberREN) at any or all of the facilities at which cyberREN is being used. The schedule can be modified at any time and printed in a two page report for easy reference, for any single facility. The schedule divides the working day into up to 4 shifts (morning, afternoon, evening and late evening), with the availability of all hemodialysis locations within the facility shown for the week for a single shift. The week is defaulted to have 6 working days, i.e. with no hemodialysis done on Sunday. plan the use of the facility’s hemodialysis locations, i.e. determine free slots and assign patients to these slots in an efficient manner. reassign caregivers to patients when assignment must be modified on short notice due to illness, etc. determine whether patients have been assigned to caregivers in a well distributed and fair manner. automatically generate the R1 Patient Care Summary report at the beginning of the day for all scheduled patients, to be used as a temporary working document. The user can advance the display forward or backward one week at a time. If the schedule for the next week is undefined, then advancing forward will cause the schedule from the previous week to be automatically duplicated. 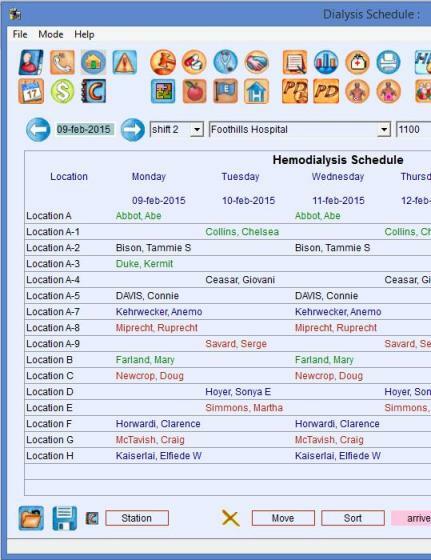 This feature decisively reduces the administrative effort of managing the Hemodialysis Schedule.